Come learn about The Principles of Our World. 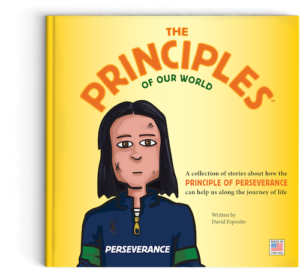 In a series of real-life stories, readers will be introduced to The Principle of Perseverance. The stories in this children’s book are meant to remind all of us about the importance of perseverance in our lives. Enjoy the book in one sitting or read just one story at a time. “Hello, I am The Principle of Perseverance. “People say I am the reminder they need to keep working hard to overcome the challenges they face. “There will be times in your life when things get really difficult. You may feel like giving up and quitting when you get tired of working hard to accomplish your goals. “When my parents came to this country, they struggled a great deal to give me and my sisters a better life. They said Perseverance was the only reason they reached their goals. When I struggled in school, my dad told me Perseverance would always help me. When I graduated, my parents gave me a shirt that says PERSEVERANCE. It reminds me of the need to work hard to overcome challenges. “Please call on me when you need the strength to keeping working hard. I can help remind you to keep trying no matter how tough it gets.